Echinol Syrup is winter supplement to boost the immune system by either preventing the common cold an flu or providing supportive measures in the treatment of common cold and flu. Echinol Syrup is composed of organically grown Echinacea purperea herba extract, Vitamin C and Zinc. Unexpectedly tasty lemony drink, allowing your body to rebuild its defence, evaporates the cold and let the warm wrap you up. Drink to relief sore throat, stuffed nose and get hydrated. Echinol Hot powder drink mix is prepared with organically grown E.purpurea extract, White Willow bark extract, menthol, vitamins C & B6 and zinc. 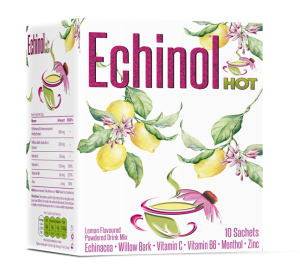 Echinol hot powder drink mix in a sachet is easy to prepare just by addling the entire content into a cup of hot water and stir.